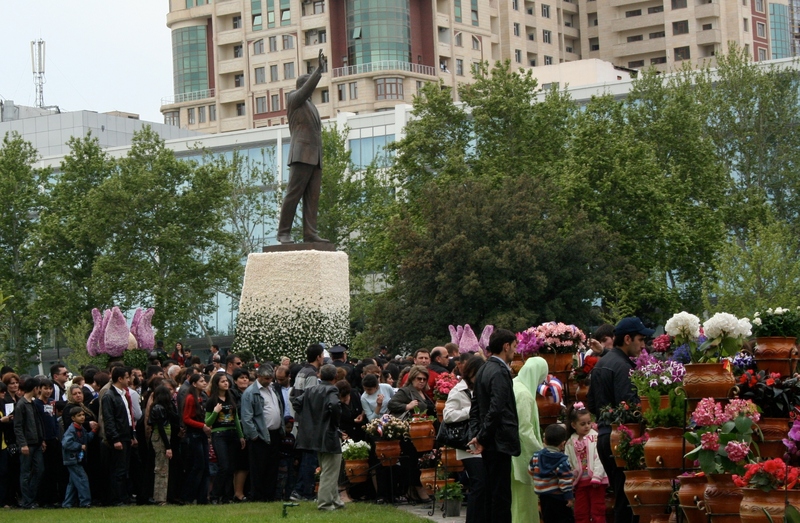 On 10 May, Azerbaijan was celebrating its annual Flower Day and also commemorating the late president Heydar Aliyev's birthday, the father of current president Ilham Aliyev. While thousands of Azerbaijanis gathered at the Heydar Aliyev park to witness a Flower Day parade, others were mourning the tragic events that took place on 30 April at the Azerbaijan State Oil Academy, when 13 innocent young students were murdered. Many of these people questioned the justice of a state celebration only 10 days after the shooting at the university. On 30 April, an ethnic Azeri, Ferda Qadirov, who had lived in Russia with his parents, entered the Azerbaijan State Oil Academy. He started shooting everyone standing in his way. The tragedy began around 9.30 in the morning, just like any other class day when students were sitting in their classrooms. The news of what was happening at the university spread quickly - Twitter and Facebook were tools used to let the world know what was happening. By 4.00 in the afternoon, there were 13 corpses and many more wounded. The state's reaction was rather slow. The day's news began with Ilham Aliyev's visit to Brussels and only later did television newscasters inform about the shooting. Some did not even know what was happening until late in the afternoon. For example, Ilham, a taxi driver, only heard about the shooting when he went to car-repair shop. The local media's reaction did not change. Throughout the day, local television stations broadcast concerts or music clips. Ironically, the accurate updates came from foreign sources: the Turkish online news, Hurriyet, and Russian news. Among the local broadcasters were ANS (Azerbaijan News Service) and Radio Azadliq (Azerbaijani language version of Radio Free Europe, banned on radio frequencies in January together with BBC and Voice of America). This mild reaction angered many students. In protest, 2,000 students marched the next day, demanding a national mourning day and cancellation of the Flower Day celebrations on 10 May. No one listened despite all their appeals. The rainy day did not stop people from going downtown to see the flowers shipped from Africa for the celebrations. Those interviewed by local broadcasters said that they were happy and the flowers looked very pretty. A high-ranking military officer in an interview with Radio Azadliq explained that people needed this, that this was the birthday of "our all-nation leader, Heydar Aliyev". On the other side of the Heydar Aliyev park, a group of young activists sat in silent protest, holding carnations and observing the crowd. International observers included Arjen de Wolff, the regional director of the National Democratic Institute (NDI) and Bart Woord, secretary general of the International Federation of Liberal Youth. After sitting on the steps of the Music Academy, the group decided to take the flowers to the Oil Academy, which was two blocks away from the park, leave the flowers on the steps of the university and go to their homes. It all happened too quickly. As soon as the group got up, some plainclothes "thuggish-looking" men started frantically talking on their mobile phones in what seemed to be conversations with those higher in the chain of command. The group only managed to cross the street when several uniformed and plainclothes police officers detained everyone. One of the main officers shouted "Take all of them in!" Several police cars were already there. Among those arrested was Arjen de Wolff. No one noted that he was a foreigner or that he was an observer. A 15-year-old girl standing at the bus stop was also detained, apparently simply because she was wearing black. At Police Station 22, where the group was held, friends, journalists, youth movement members were waiting impatiently outside. Each attempt to get some information failed. No one explained why these people were detained and when they would be released. Around the same time, another group of youth activists were being detained for openly speaking out about the massacre. Unlike the group detained in front of the Music Academy, these people were mistreated. Some of the girls had their hair pulled, arms twisted. Videos appeared of police officers shouting at the waiting crowd outside of Police Station 39 to leave or disperse. Another video documented how the police beat a person. By around 6.00 in the evening, all those arrested were released, with no severe wounds. However, the biggest wound was left in the hearts and the minds of those who were there and saw everything. How could innocent activists be arrested for walking on the street with carnations in their hands and wearing black (and not even everyone wore black)? All day long, none of the TV broadcasters said anything of the arrests except for updates on the celebrations and the President's visit to the city's most recently opened parks. Ironically, the first lady, Mehriban Aliyeva, wore black throughout day. Upon their release, interviews were given, statements made. Emin Milli, one of the creators of AN Network - a youth network focusing on democracy building in Azerbaijan - in an interview with OL! Youth movement said that the police could not even tell those detained inside (including himself) on what grounds they were detained.